SAVE $11.00 vs. Buying these items individually! Who doesn’t enjoy products to make them feel special and pampered? 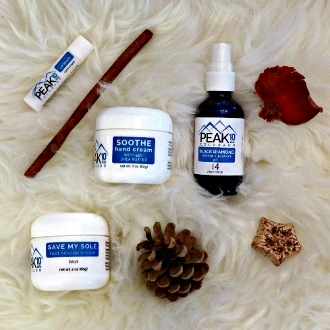 Pamper ME gift set is the perfect treat for anyone who loves to take care of themselves with quality products. Our rich and creamy SAVE MY SOLE foot rescue cream and SOOTHE hand cream contain 25% Shea Butter, known for its moisturizing and soothing benefits. BLACK DIAMOND restore + protect oil is a light luxury oil blend, perfect for your face, around the eyes, lips, cuticles or in your hair or even beards (for men). The antioxidant lip balm with Vitamin C, will hydrate and protect your lips in any climate! Perfect for applying under lip stick or wearing alone.